20. Should I give to this charity? 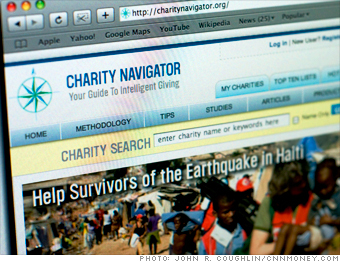 Whenever there's a disaster such as the Haiti earthquake, scams aren't far behind. This respected site can tell you if the charity soliciting you is (a) legit and (b) effective. Type its name in the search box and you'll see a star rating. Three stars or above means the outfit has low overhead and is financially sound. (Three charities working in Haiti that score well: American Red Cross, Doctors Without Borders, and United Way of America.) No rating? The charity may not have 501(c)(3) status (so your donation may not be deductible), it may not really exist, or it may be too new or small for Charity Navigator to have rated. Coolest feature: You get recommendations for higher-rated charities (if any) that do similar work to the one you're checking out. Try this too: If you make your donations through Networkforgood.org, you'll be able to get all your deductible receipts in one place -- and might cut your charities' processing fees too.